It is late winter now and so far we’ve escaped without suffering colds or flu (although my fingers are crossed). With the unforgiving winter weather this year many of my friends and colleagues have come down with either colds or flu. Some took flu shots but got sick anyway. I had a flu shot some years ago and it made me feel sick so I haven’t repeated it since. Even with the temperature going up and down from 50 to 0 F. within days and not enough sleep, we still managed to ward off colds and flu. What we have been doing aside from staying away from people who are sick, is drinking our home made ginger tea. There are no tea leaves in it, just ingredients that can be purchased at any food store. This tea recipe was passed along from my grandmother and it does the trick for us. We keep sipping it once we start to feel something coming on. The end product of my ginger tea in a cup our friend gave us two years ago. Fresh ginger, peel off the skin, puree and squeeze the juice out. I make enough to fill one small bottle at a time and keep it in the refrigerator for a week (usually finishing it before then). I use one table spoon for one cup of tea. Honey, one tablespoon per cup of tea. I dissolve it in hot water before adding other recipes. That little jar is from our own hive. Fresh lime juice, one tablespoon per cup. 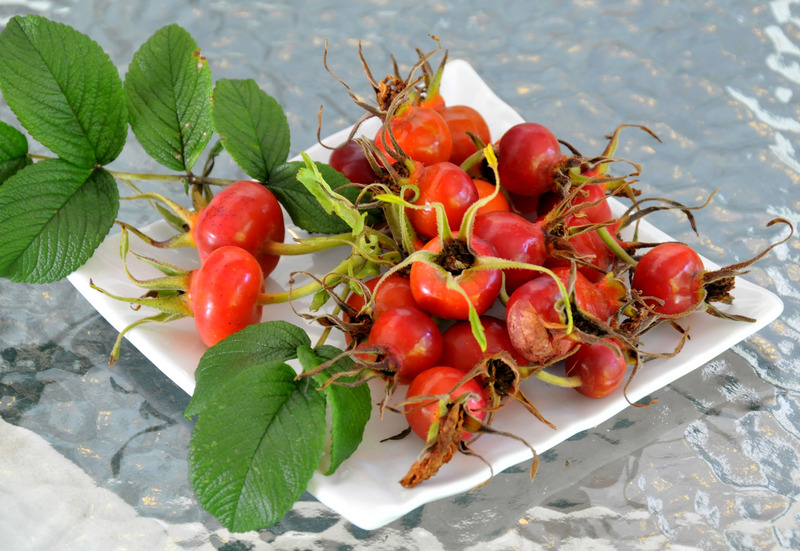 Rose hips, approximately a tablespoon of either fresh or dry. 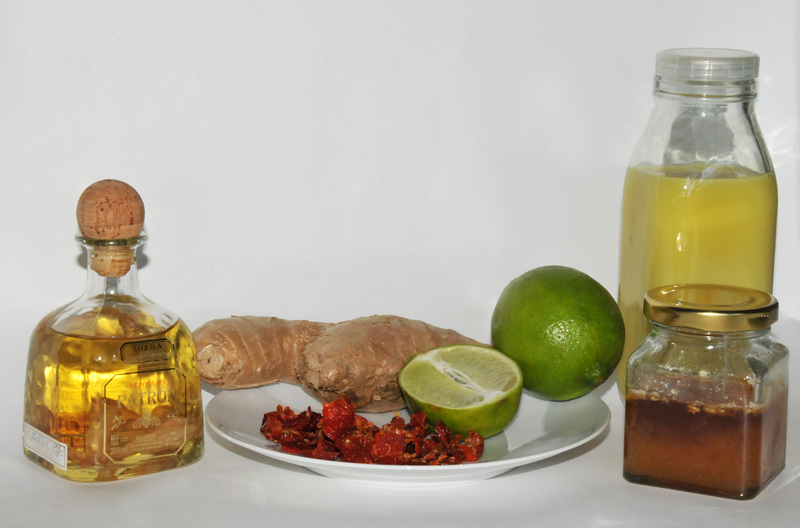 This is optional but adding it increases the level of vitamin C.
Hot ginger tea without lime juice, rose hips and liquor is also good for indigestion and bloating. 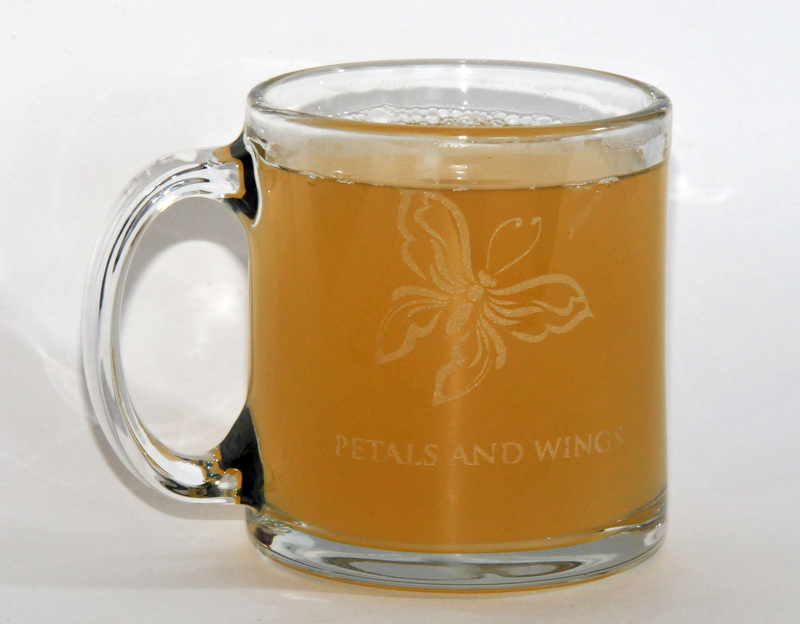 Just using fresh ginger juice with a little bit of honey to make it more palatable. Sip it when it is still hot. Rose hips picked from Rugosa ‘Hansa’ rose last season. 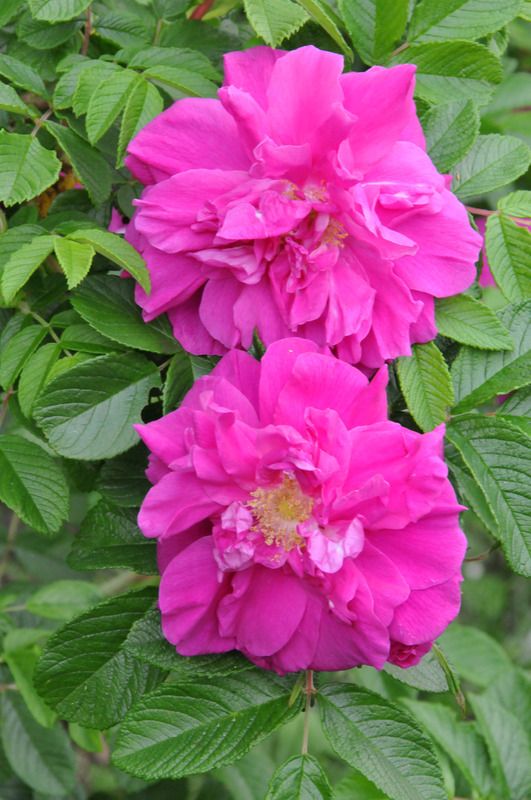 Rugosa roses (Rosa rugosa) are not just pretty, fragrant and hardy, they are also the best for producing rose hips. 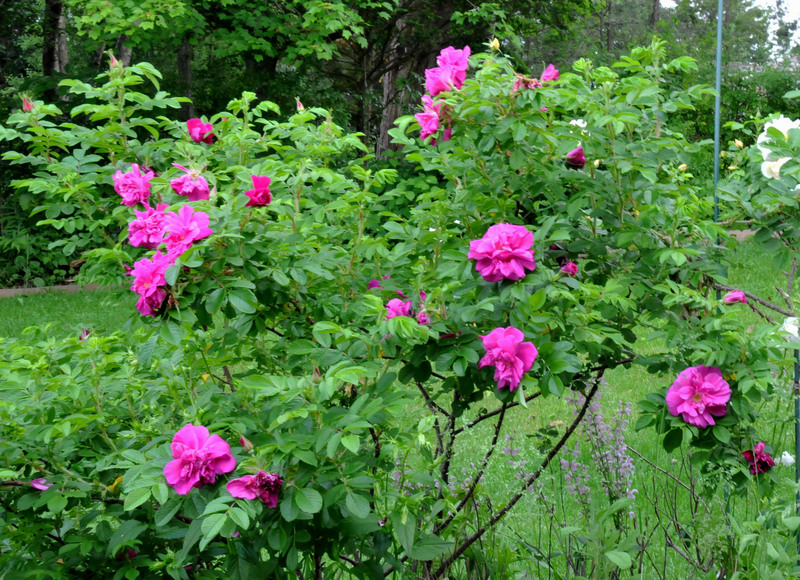 Rugosa ‘Hansa’ and ‘Foxi’ provide a lot of rose hips for me. I’ve been eating some ripe ones right in the garden and dry the rest for using until I get a fresh batch in fall. 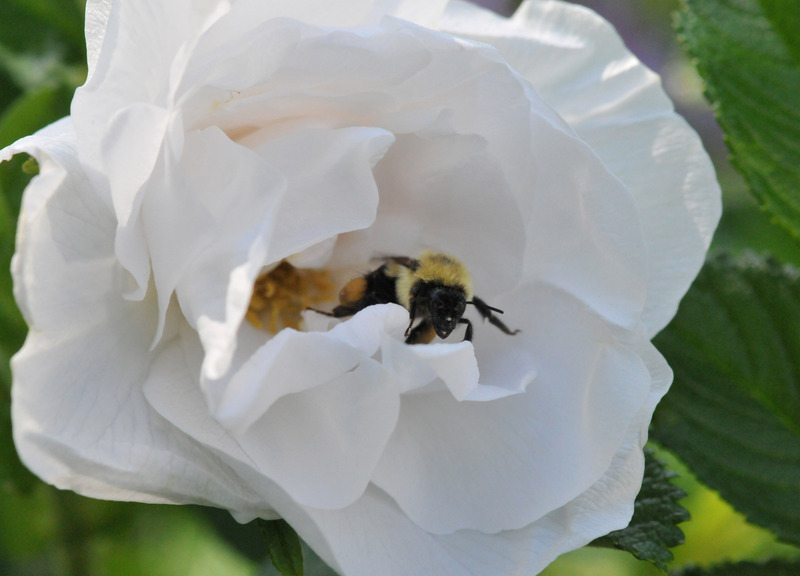 Rugosa roses are also bee friendly, both bumble bees and honey bees, love them. 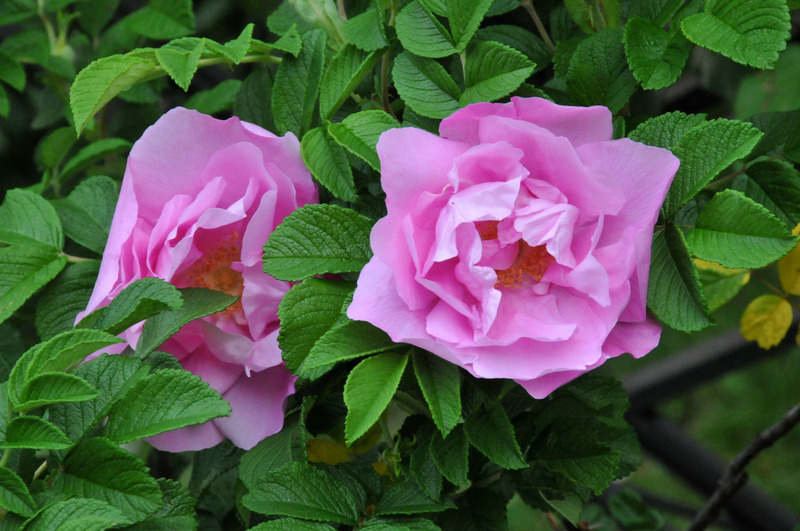 Rugosa ‘Foxi’ produce fragrant flowers in abundance from late spring to fall. I guess we can’t have everything. After raining for a few days, the weather has returned to early spring in which night temperatures hover around 50°F. It’s great for the roses but not so great for tomatoes, peppers and beans. The vegetables grow very slowly in temperatures like this. 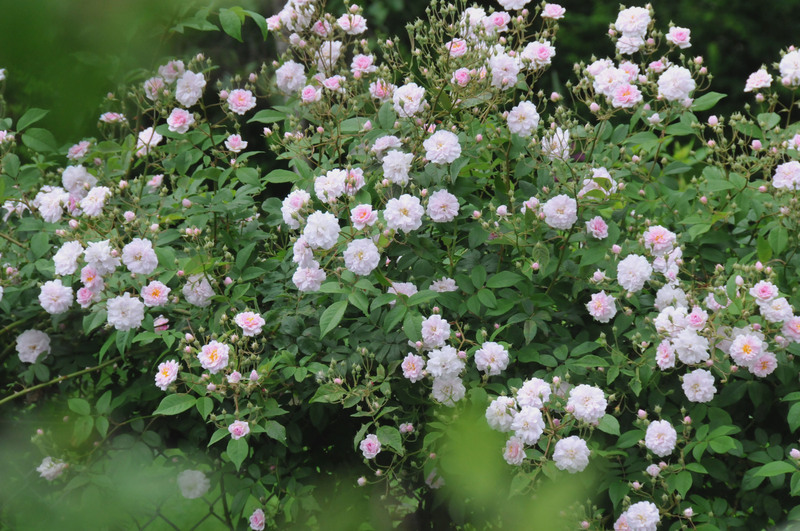 But the roses that survived the recent heavy rain do last longer and their fragrance is more pronounced in cool temperatures like this than in heat. 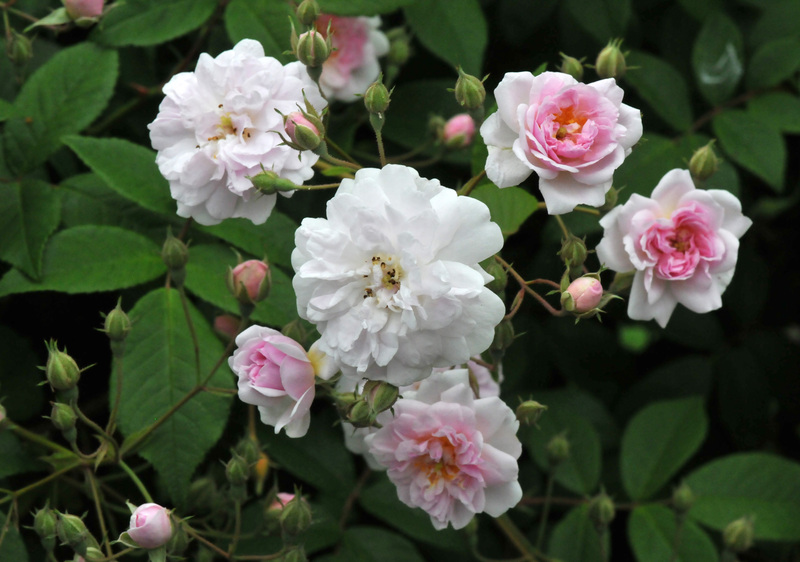 ‘Heritage’ is a David Austin Old-Fashioned rose. 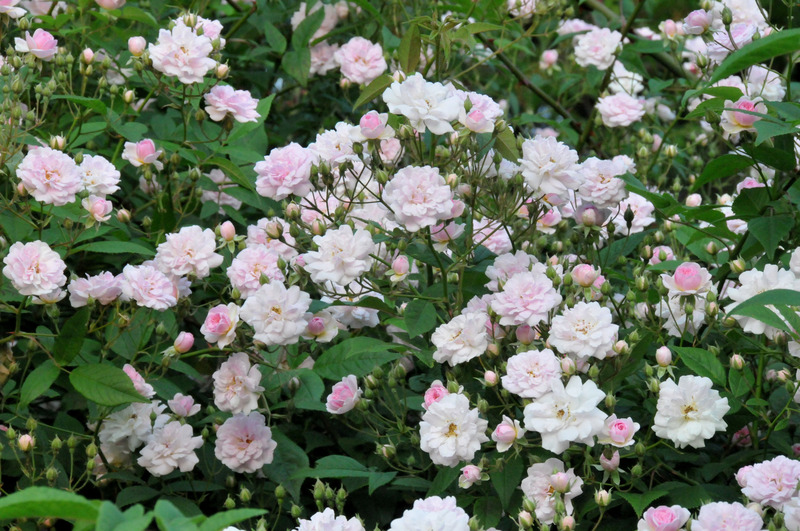 Aside from a strong fragrance and a lovely pale pink color, it continues to bloom through fall. ‘Heritage still stands after the rain. 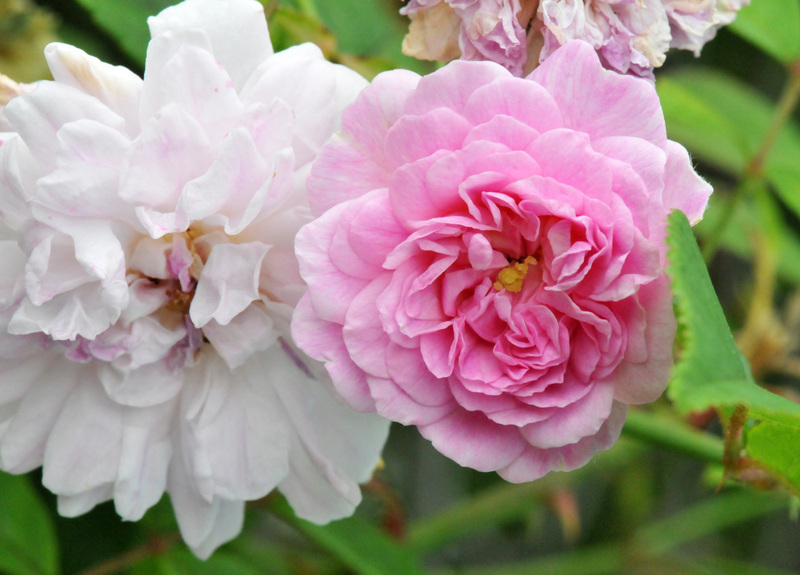 ‘MME Isaac Pereire’ is an Old Garden Rose with over 100 petals on each and highly fragrant as well. It’s bloodline can be traced back to the 1800s. When it is in full bloom, the flowers are so heavy that the stem can hardly hold each flower up. It would have looked better if the caterpillars didn’t like the leaves so much. 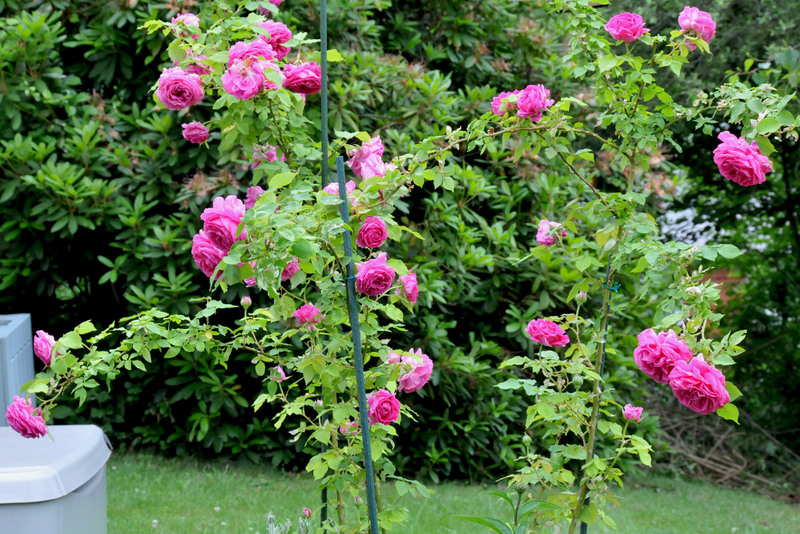 Each flower of MME Isaac Pereire rose is so heavy that I have to stake them to keep them upright. ‘Eden’ still blooming. It’s happier this year since I pruned the lilac next to it; providing more air flow. 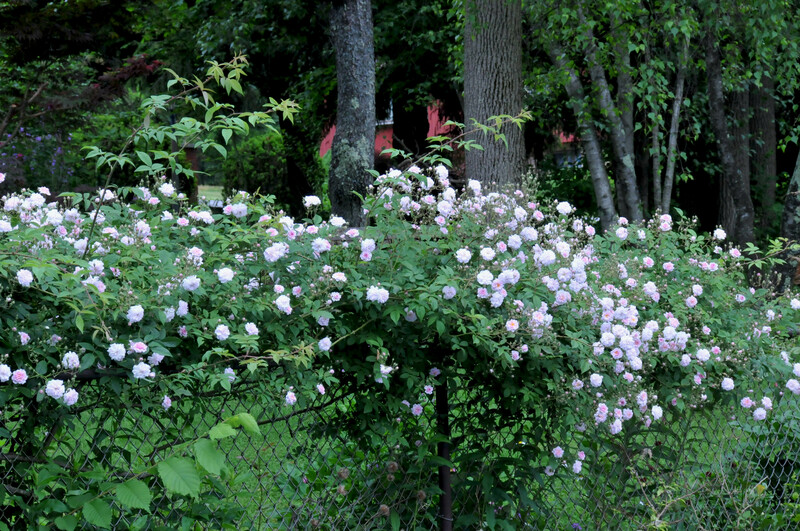 Aside from the Rugosa roses that bloom early, some of our climbing and rambling roses are also blooming. The sad part is most of them bloom only once a year. All of the ‘once blooming’ roses in the garden are ones that I planted very early on when I had no idea that some of the roses in this climate bloom only once a year (I grew up in the subtropics where they bloom all year round). I select more carefully now. 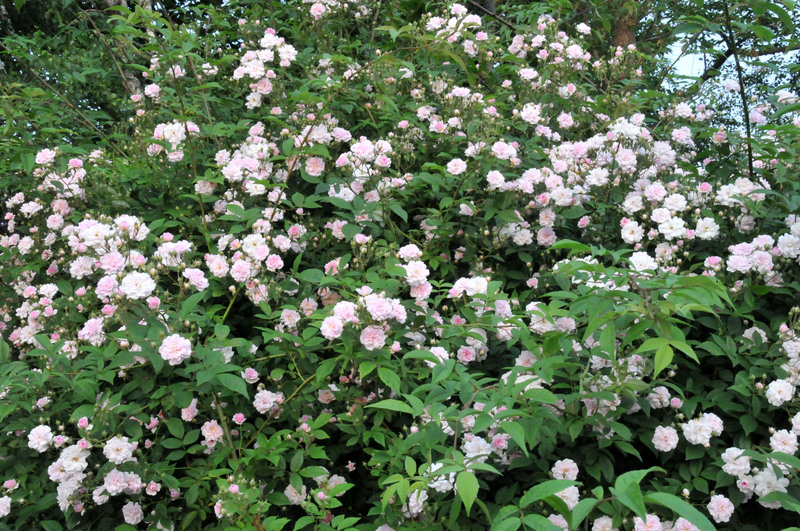 The once blooming rambling rose that’s worth growing is the ‘Paul’s Himalayan Musk.’ When it’s in full bloom, aside from a sea of small pink flowers, the honey scent is lovely. It can grow around five to six feet a season and can grow more than thirty feet in length. 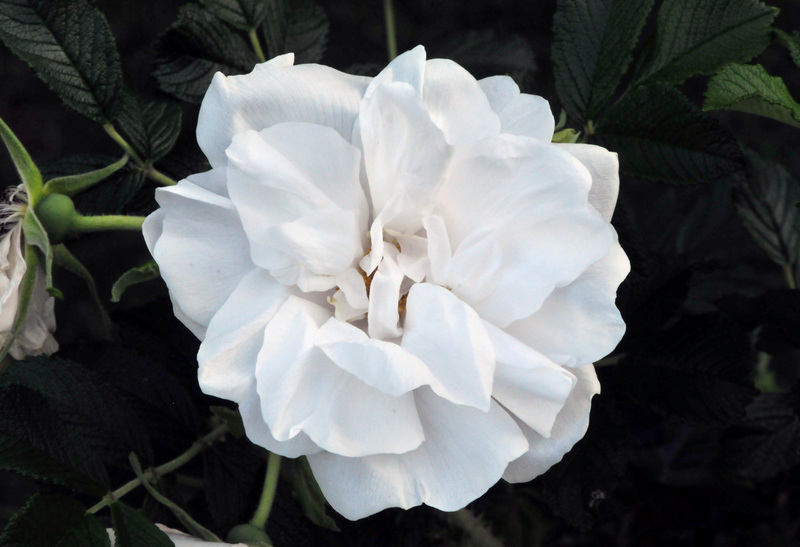 This rose and it’s cousin – Himalayan Alba- are the ones that give me grief every spring. Pruning rambling rose is not an easy task. I gave both of them a crew cut this spring and they have already filled up the empty spaces. Both of us attempted to dig out the Blaze many times because all of the leaves drop off after it finishes blooming, mostly from black spots and in some years, mildew as well. But it manages to change our mind every spring when its branches are cover with bright red flowers. 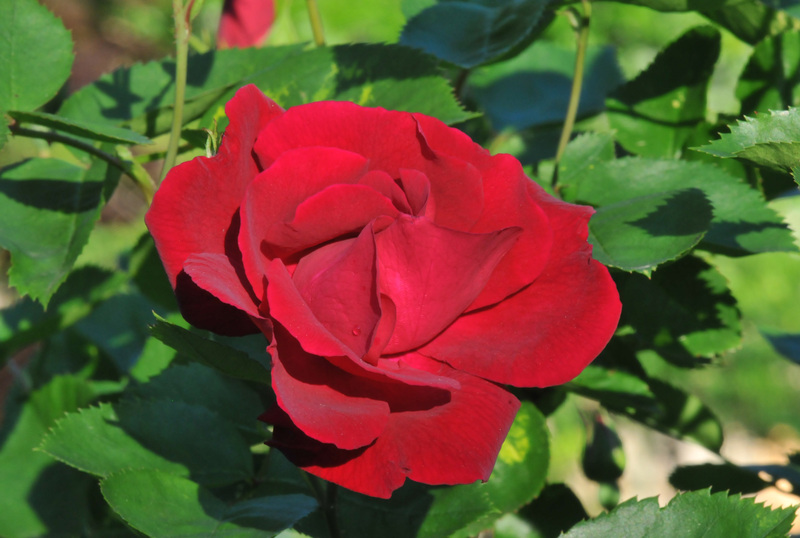 It is another of the roses that I originally planted. One of these days, either I figure out how to deal with the black spots or I’ll just dig it out and plant a different rose that will bloom all season. It’s a heart wrenching decision. 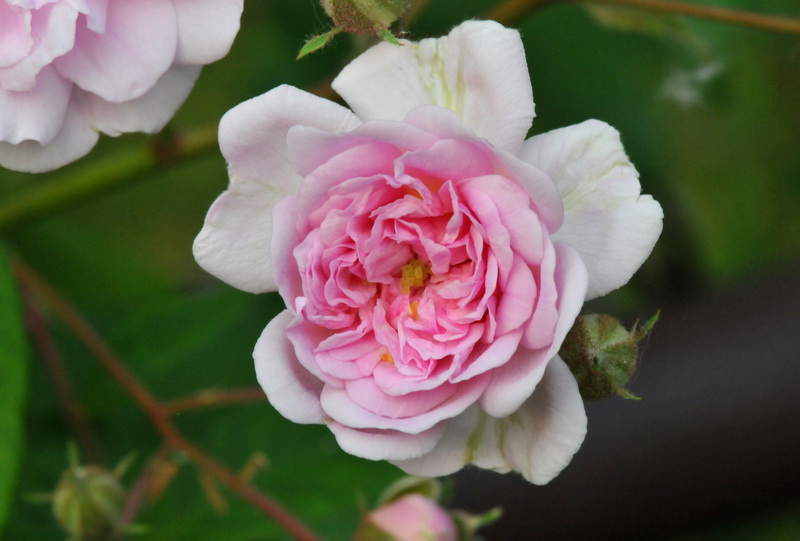 Zephirine Drouhin is an Old Garden climbing rose that will bloom throughout the season and is highly fragrant as well. The deer ate most of its new shoots last year but this year I managed to discourage them so it bloomed profusely in gratitude. 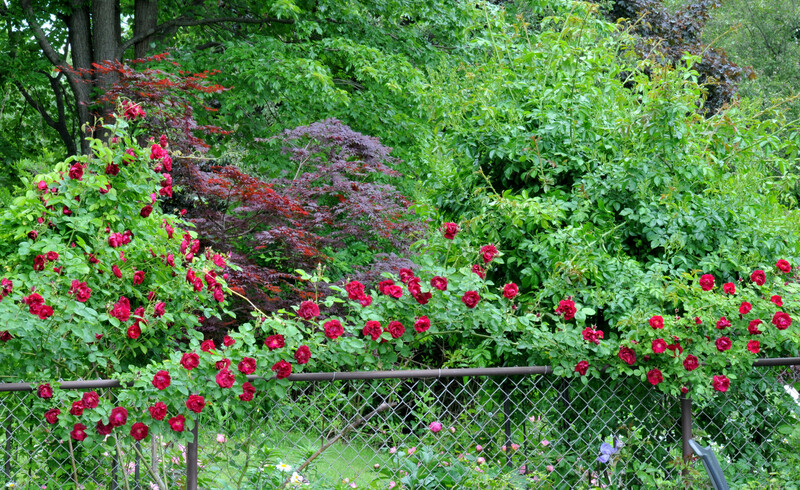 We grow climbing and rambling roses to cover the unsightly pool fence. This is where Paul’s Himalayan Musk and Blaze meet. Blaze has been loading its branches with bright red flowers every late spring but its leaves drop afterward, caused by black spots. How can we dig it up when it manages to do this every spring. 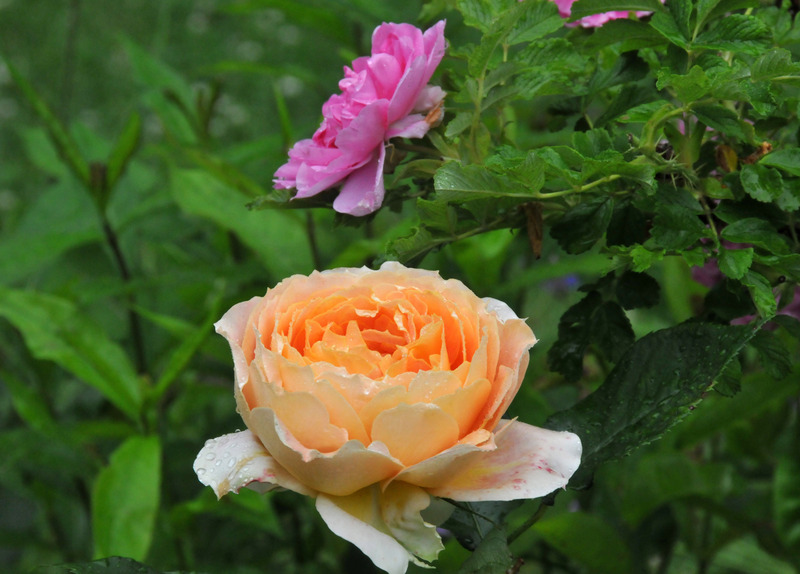 The weather started nicely for roses this year…cool and dry with little rain. Our early bloomer roses formed buds profusely and they’re in the middle of their first round exhibition of colors and scents. Then the rain came. A nonstop deluge for a day and a half. There are still some flowers left after the rain, though not much. Hopefully there will be no rain this weekend so I can cut all the wet and spent flowers off before they develop mildew. 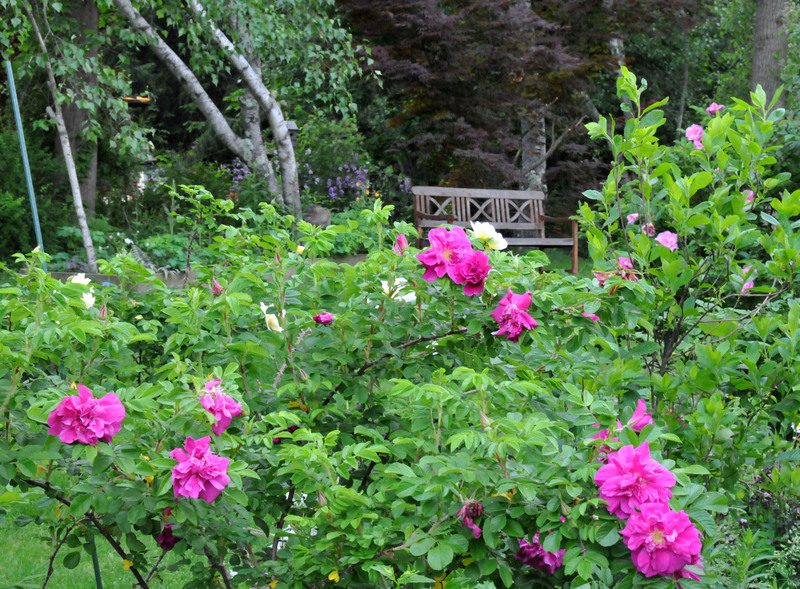 After the first round blooming, the roses in the Rugosa family (Rosa Rugosa) will continue producing flowers throughout the season. 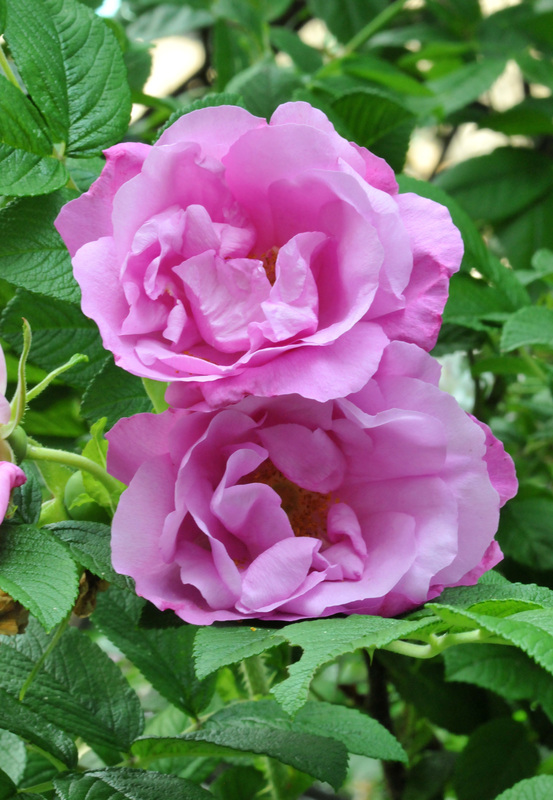 The Rugosa rose is very winter hardy, fast to establish and grow, reliable performance through the season, fragrant, deer won’t eat them and the bees love them. The down side: they are very thorny and some of the the flowers don’t last longer than two days. Here they are before the rain came. 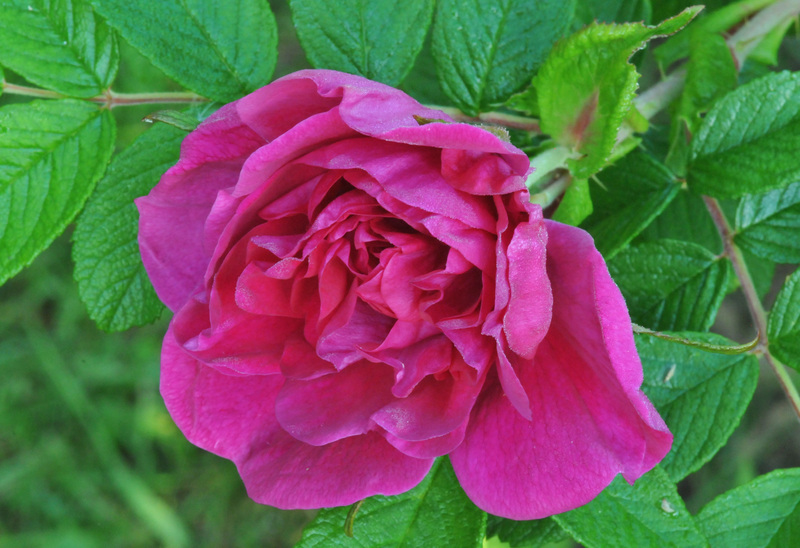 Rugosa ‘Hansa’ is deep pink and highly fragrant. They produce big rose hips. I left some of the hips on so I can use them for tea. 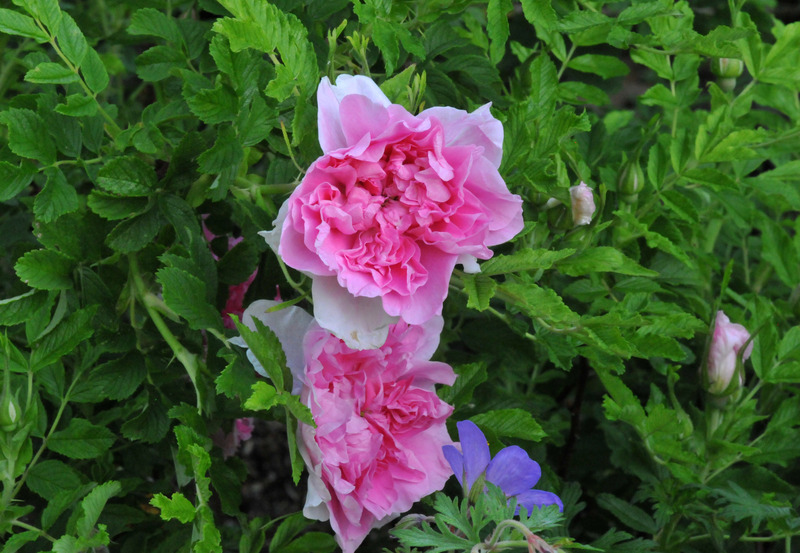 Rugosa ‘Doreen Pike’ has so many flowers that weigh the branch down. It’s fragrance is strongest in the morning. We came back from vacation just in time for the Paul’s Himalayan Musk bloom. It would have been a tragedy to miss it since it blooms only once a year. The garden is covered with a honey scent, especially when the temperature is a little on the cool side. I did give it a hard pruning early in spring, before the leaves unfurled. It still grew back to cover its trellis and part of the pool fence as well. Once it blooms, all the pushing and shoving their way through the garden is forgiven. My guilty conscience set in too, so I let it grow. I will have to give it a crew cut again once the flowers fade. But I’ll leave some to develop rose hips for the birds. The cluster of little pink flowers in various shades; the early bloom is a deeper pink and then gets more pale as it gets older before fading. The garden ground is carpeted with pale pink petals that fell and settled there. I like to walk back and forth under the trellis when it blooms. The satisfaction of walking under it and through the perfume from the roses is worth it, even though once a year. Trellis filled with cluster flowers. 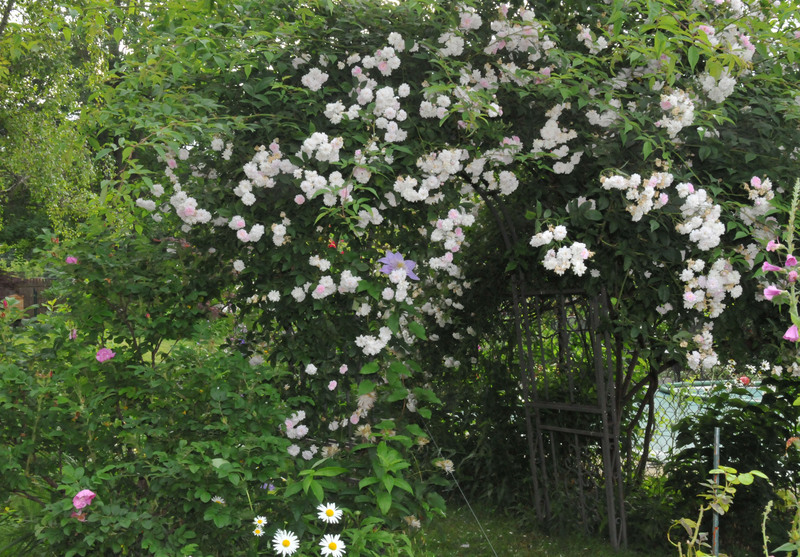 The other side of the trellis, with “Foxi” rose and “Crystal Fountain” clematis. How many books on deer resistant gardens are in the marketplace? Plenty. But I found that 80% of the allegedly deer-proof plants on the list got eaten anyway. If the deer are hungry enough they will eat any plants they can get their teeth into. The few plants that deer won’t touch basically narrow down to three categories: highly scented (mints, sage, lavender…any plants that will emit a strong odor when you just brush against them), poisonous (foxglove, lily of the valley), and the very thorny. 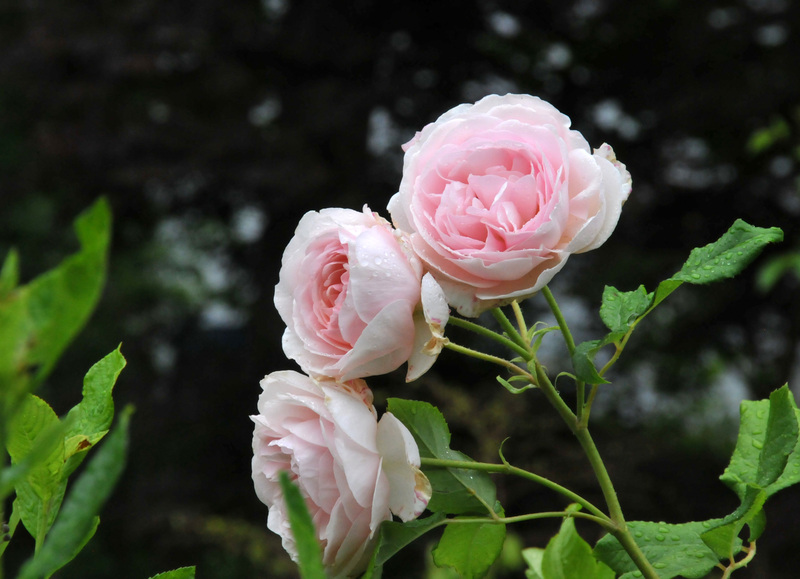 We love roses, especially the fragrant ones. We keep our eyes on the swelling buds in hope of seeing their beautiful colors and enjoying their sweet fragrance. They disappear over night, cleanly nipped off at the bottom of the buds. Our rabbits weren’t suspect, even if they got on their hind legs they couldn’t reach the buds. Only whitetail deer could do this type of damage. Sometimes they add insult to injury by leaving piles of detritus that had passed through their digestive system for us on the lawn. It’s a matter of which perspective you’re looking from; it could be an insult or a gift since the grass grows greener and healthier where their deposits were. 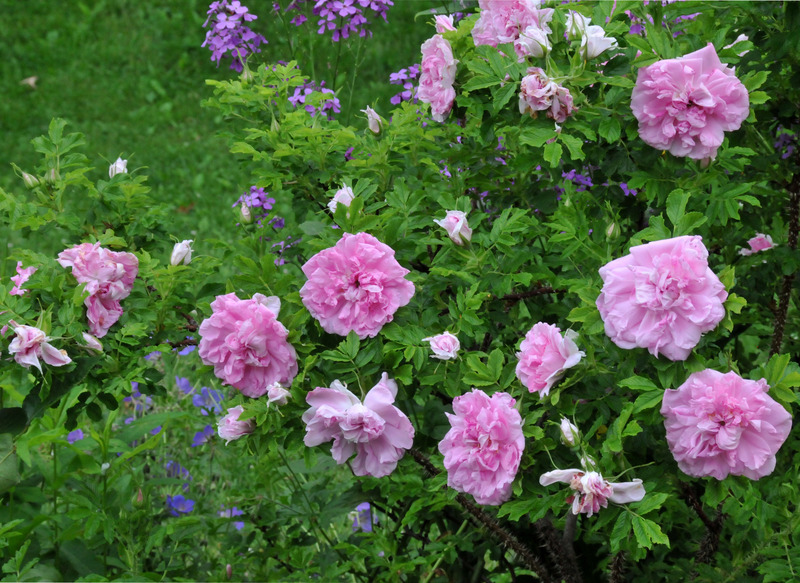 I picked Rugosa rose (Rosa rugosa) for its fragrance and winter hardiness. I soon realized that the deer skip the rugosa buds but ate other rose buds. Even without the mixture of rotten eggs and garlic spray we use to deter them at night they still won’t touch it. 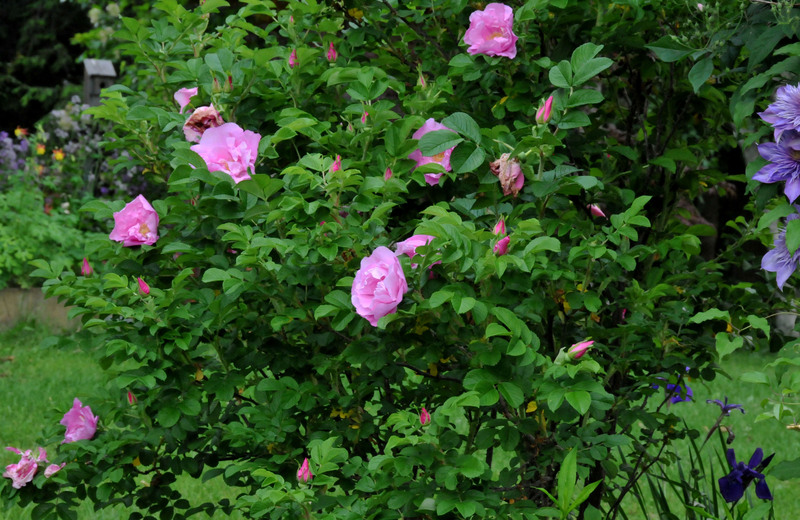 The difference is rugosa are pretty thorny, much more thorns than any other roses and highly fragrant. Blanc de Coubert. Bees love to roll in the flowers. Foxi. 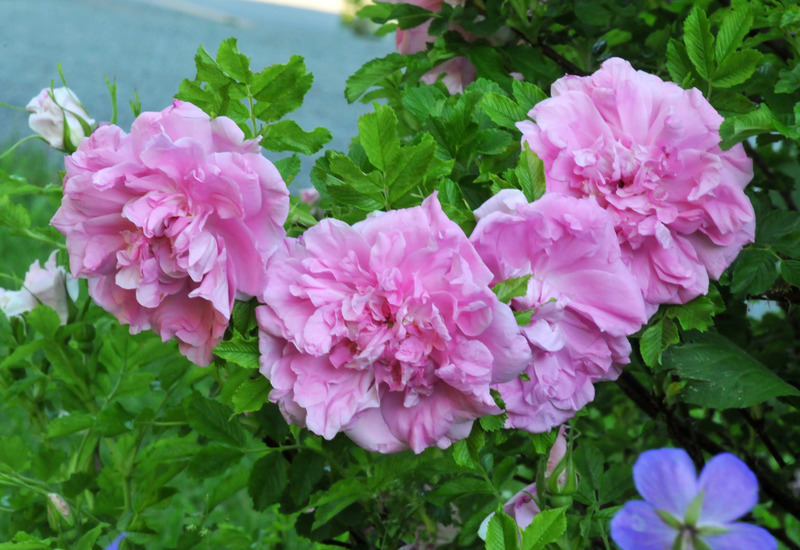 Pink-lavender and extremely fragrant. 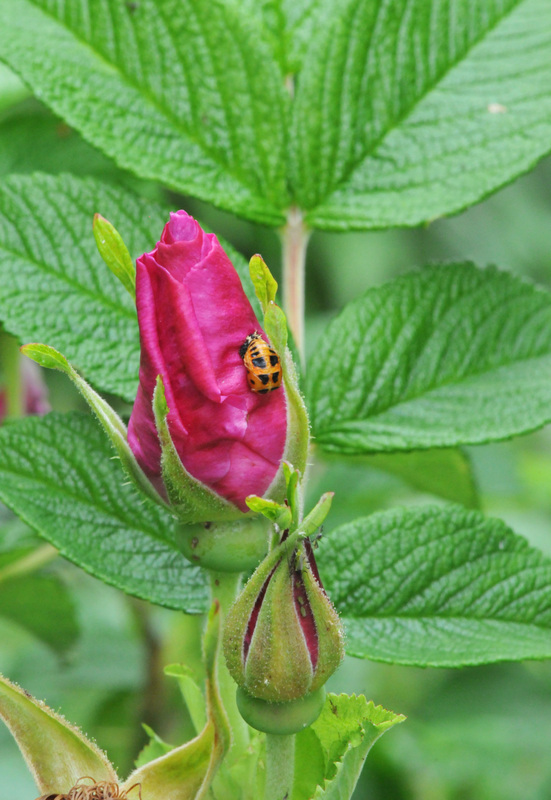 Lady beetle at all stages love the rugosa. Another plus. 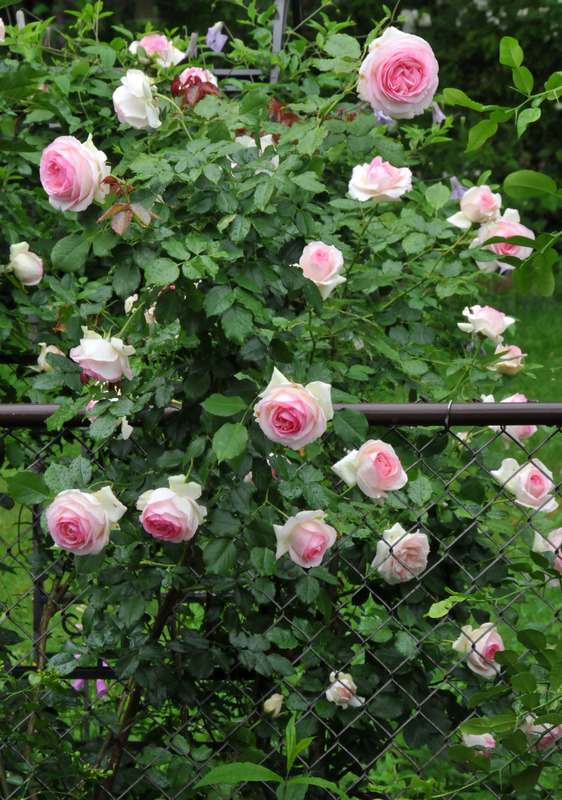 Every year in June is the time for roses to push out and bloom. 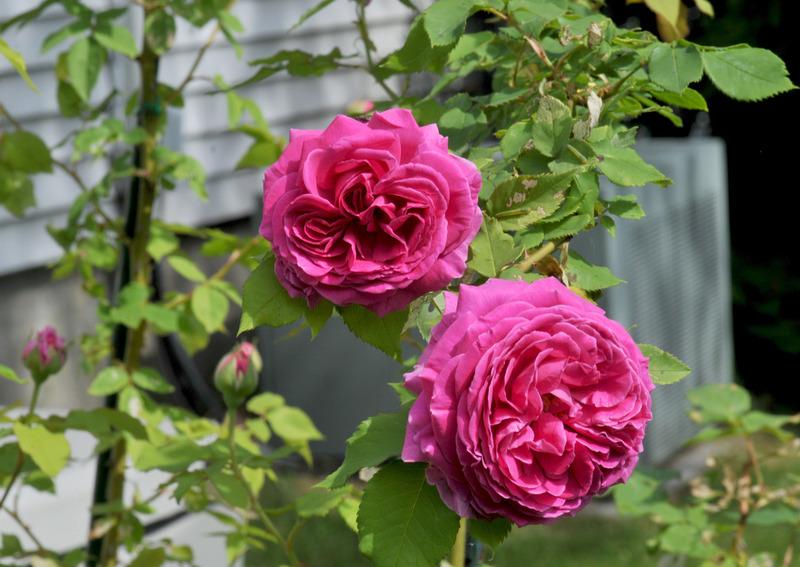 We have a mix of once a season blooming and continuous blooming roses in our garden. 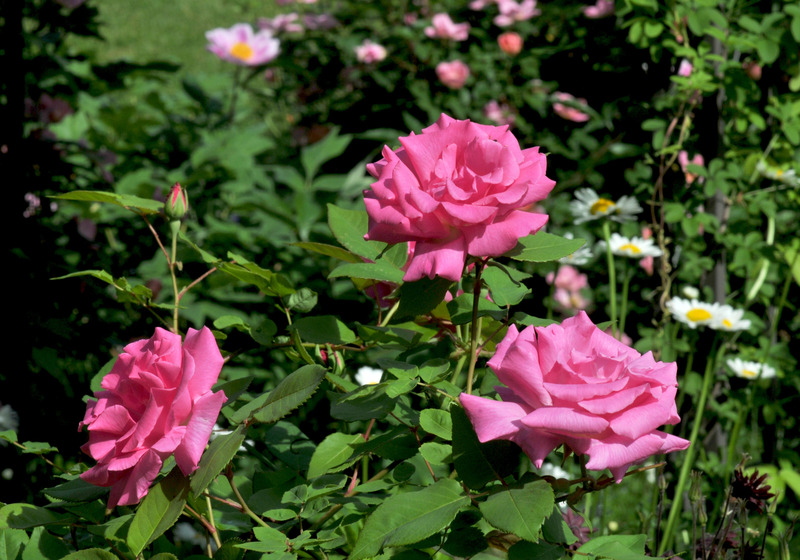 When I started fixing our garden, I didn’t know that some roses in this climate bloom only once a year. The roses in the tropics bloom all year round, at least in my parents’ garden. 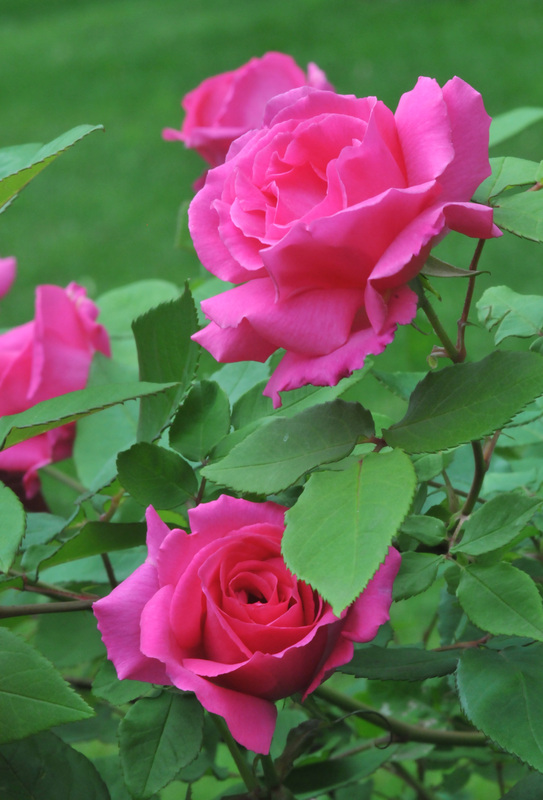 I picked the roses based on fragrance and color, never considering how many times they would bloom in a season. I’m better educated about the roses now, not much better but better than before. I picked Paul’s Himalayan musk because we needed something to cover our unattractive chain link pool fence. When I found this rose in the catalog it was perfect; rambling, soft pink in color, honey scented and will survive in our climate zone. I didn’t look at whether it was once blooming or continuous blooming during the season. The first time it bloomed, it took our collective breath away. There wasn’t much arching of the branches, but every stem produced a profusion of buds, which opened to soft pink, then faded to almost white before dropping off. But, what captured us most was the honey fragrance, and, in the heat of the day, a little spice added in. Five years later, it covers a large portion of the fence and a trellis. I have to cut it back every spring to keep it confined and make room for other plants. This is one of the roses I have a fight with every spring. The other is its cousin, the Himalayan Alba. Once established, both of them can easily shoot up 10 feet or more in one season. There is no doubt that they are true ramblers. Bill will cut the branches sticking out over the pool in the middle of summer since the thorns keep catch us when we walk past. As much as we love the flowers we like to have easy access to the pool deck with out being poked with sharp thorns. A lot of the flowers have opened up now. 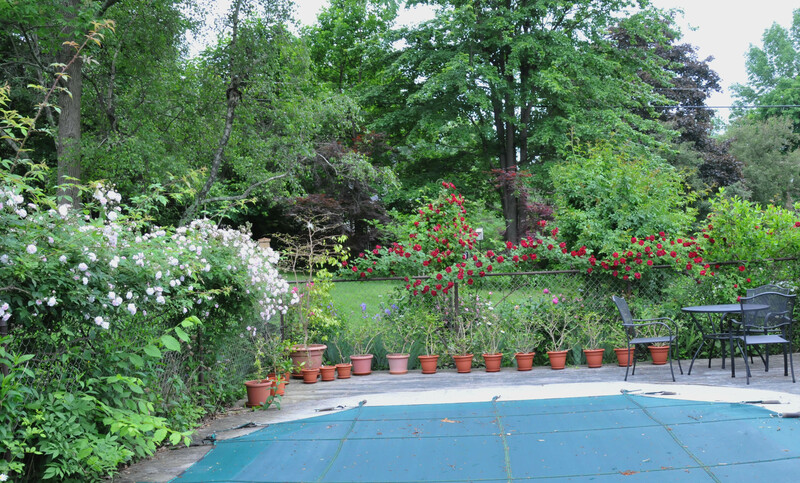 There will be a sea of pink floating over the pool fence in a week then the whole garden will smell like honey. The bees will be busy working on hundreds of roses. The ground will be carpeted with petals; some will fall in the pool. It’s very romantic to float among rose petals looking up at the blue sky while breathing in a mix of fresh, sweet fragrance. ..Paradise. Until reality catches up and we have to clean it out of the pool. 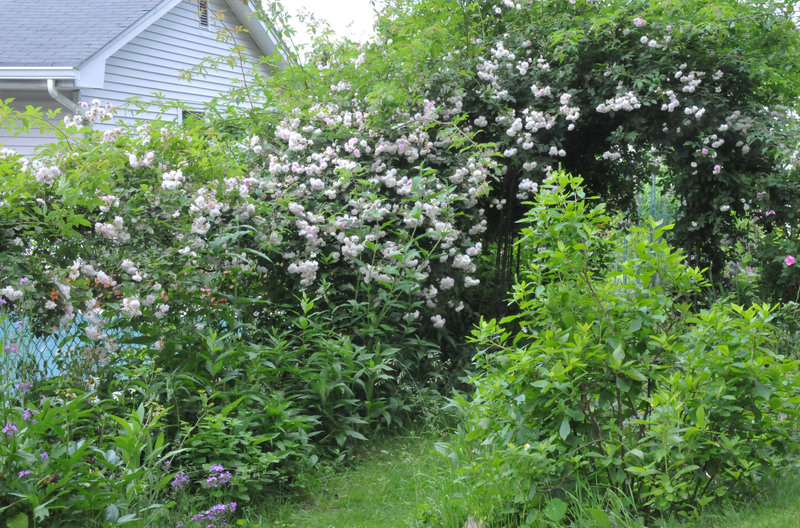 I don’t have anything bad to say about the Paul’s Himalayan Musk aside from blooming only a few weeks every spring. But to make up for the lack of flowers, it provides little red rose hips that will bring in the Cedar Waxwings and provide a beautiful decoration in winter. I will cut whatever is left of the hips in spring along with the weak or unruly branches. If you have a lot of space to cover, plant it.